Refrigerant leaks are becoming more and more prevalent. Higher pressures of refrigerants and inferior installation material can contribute to these leaks. Whether it’s a residential air conditioning system, an automotive system or a freezer, refrigerant leaks cost dearly and it is crucial to detect them in time. Fixing refrigerant leaks is not the problem — detecting them is. This is where refrigerant leak detectors come into play. A leak detector is an essential tool for HVACR technicians. Diagnosing and rectifying a problem within a refrigeration system is an important skill. There are many refrigerant leak detectors in the market and choosing the right device for your needs can be a challenge. INFICON offers a range of leak detectors that meet your needs for residential, commercial, industrial or automotive AC or refrigeration. In this article, we will review INFICON TEK-Mate 705-202-G1, one of the best refrigerant leak detectors. What is the INFICON TEK-MATE Best For? The INFICON TEK-Mate 705-202-G1 is an ideal refrigerant leak detector for the low-to-medium duty user and fits into any kind of budget. This device helps you detect and locate refrigerant leaks quickly and accurately. It helps you locate leaks in industrial, residential and automotive units. The INFICON TEK-Mate comes with heated-diode technology that uses high-temperature ceramic substrate sensor and a reactive element. It has a built-in heating element that maintains high temperature and is capable of detecting CFCs, HCFCs, HFCs, and blends such as think R11, R12, R22, R123, R134a, R404A, R410A. When halogenated gas contacts the hot surface, molecules break off from the reactive element and are shown on the LED display and produce an audible alarm. The device automatically compensates for background contaminations and has a controllable intensity for the audible signal. It is reliable even under damp conditions. The sensor provides equal results to CFCs, HCFCs, HFCs, as well as blends and does not require the technician to identify the refrigerant in use or to set a selector switch. When looking for HFCs, the device does not overstate the frequently-present traces of chlorine-bearing vapors. The INFICON TEK-Mate is very stable and highly sensitive. A release that is as low as one millionth of a gram of gas can be indicated to be a leak. The device is lightweight and portable. It comes with a 17-inch rugged flexible metal probe and features 0.4 oz./yr. sensitivity to CFCs, HCFCs, and HFCs. The electrochemical heated-diode sensor provides the highest sensitivity and detects all halogenated refrigerant gases, including the smallest of leaks. It comes with adjustable sensitivity with low and high sensitivity settings. It offers similar responses to all CFCs, HCFCs, HFCs and refrigerant blends (i.e. R-404A, R407c) and SF6. No need to select the refrigerant you're working with. It’s highly reliable. Automatic background compensation feature constantly monitors and adjusts for changing background contamination and eliminates the need for manual adjustment. This feature increases the accuracy of detection. The device pinpoints the location of the leak in coils and other internal components. Design: The device is lightweight, portable, affordable, and works well in residential and mid-level commercial settings. It comes with a long, rugged, and flexible probe and it’s best suited for all your needs for indoor settings. It has a flashing LED for and an audible beep to alert for leak detection. It runs on two D-size alkaline batteries and offers long-lasting performance and ease of use. In cases where background gases are present, it may sometimes trigger false alarms. Not a perfect tool for outdoors and heavy refrigeration settings. 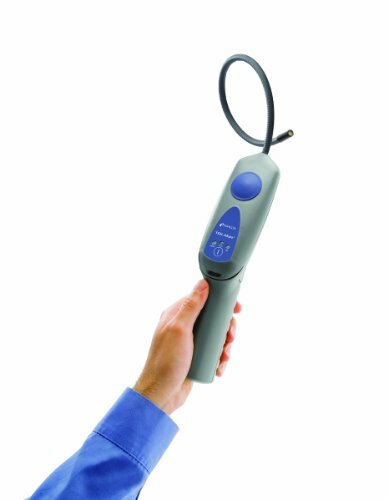 The INFICON TEK-Mate is a top-quality leak detector that comes with proven heated-diode technology. It is very efficient, yet affordable. It is equally sensitive to CFCs, HCFCs, and HFCs and eliminates readjusting for different refrigerants. It automatically compensates for changing background contamination and it’s reliable. The device pinpoints leaks quickly and accurately. It comes with a flashing LED, a variable intensity audible alarm, and a low battery indicator. The INFICON TEK-Mate 705-202-G1 is made in the USA and comes with a 2-year replacement warranty. INFICON has a good reputation for its customer service and it is unlikely that you will have any problems with warranty. Refrigeration systems rely on the refrigerant to work. To maintain the best cooling, refrigerant leaks have to be detected and dealt with in time. Though there are other ways to detect refrigerant leaks, an electronic detector is a better option for a professional. The INFICON TEK-Mate 705-202-G1 is the best leak detector in its class and comes at an affordable price. Its heated-diode sensor detects and pinpoints leaks faster and accurately. It can detect even the smallest leaks of CFCs, HCFCs, HFCs, and blends. It also compensates for background contaminations. It will save your time and increases your confidence and efficiency when working with refrigeration systems. The INFICON TEK-Mate is a must-have leak detector for a refrigeration professional.